Islamabad wants a former CIA station chief in Pakistan to stand trial on murder charges over a 2009 strike that killed at least three people, as well as waging war inside the country. Justice Shaukat Aziz Siddiqui, of the Islamabad High Court, ruled Tuesday that Jonathan Banks, the former CIA station chief in Islamabad, and John A. Rizzo, a CIA lawyer, should be held legally accountable for a December 2009 drone strike that reportedly killed at least three people. The court order is unlikely to become more than a symbolic gesture since both Banks and Rizzo quit the country back in 2010 after Karim Khan, a Pakistani journalist, pressed charges against Banks over the aerial strike on his home in North Waziristan that allegedly killed his brother and son, both government employees. "We appeal to the authorities not to let Jonathan Banks escape from Pakistan," Khan declared outside an Islamabad police station in December 2010. "He should be arrested and executed in this country." Khan was also seeking $500 million in damages from the US government. The legal action against Banks blew the CIA station chief’s undercover status, forcing him and Rizzo to quit the country. To this day it remains unclear how Khan and his lawyer Shahzad Akbar discovered the identity of the CIA chief, although some suspect Pakistan’s intelligence agency revealed the name as US-Pakistan relations at the time were rapidly deteriorating. One Pakistani newspaper suggested that Banks’ identity was released after a US court “had summoned top officials of Pakistani spy agency Inter-Services Intelligence (ISI) and others as the alleged masterminds of the 2008 Mumbai terror attacks” on behalf of the families of two American victims. Media reports at the time suggested the target of the CIA drone strike was Haji Omar, then the Taliban commander for North Waziristan. Khan denied the claims. US drone strikes have reportedly killed hundreds of innocent people in Pakistan, sparking a public backlash and creating political tensions between Islamabad and Washington. Since 2004, the CIA’s Special Activities Division has relied upon unmanned aerial drones to hit targets in northwest Pakistan along the Afghan-Pakistan border. Initially started during the administration of President George W. Bush, drone strikes increased significantly under his successor, Barack Obama. 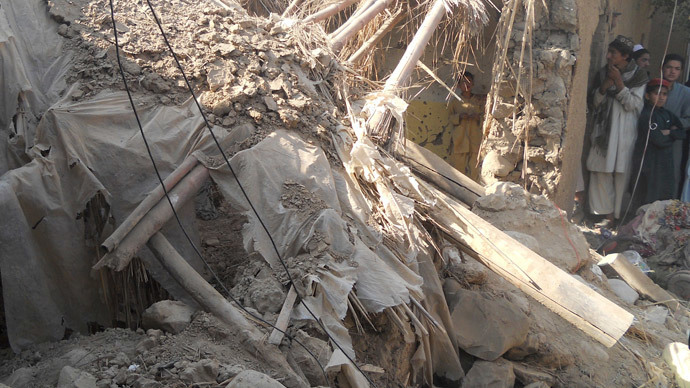 In October 2013, a UN investigation determined that US drone strikes had killed at least 400 civilians in Pakistan – a number far higher than Washington had reported. 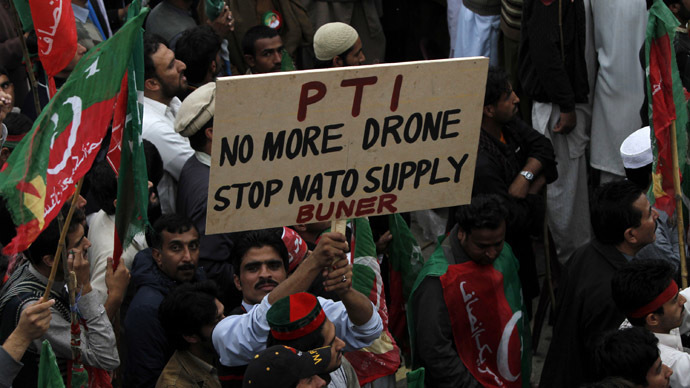 The drone strikes have led to deep strains in the US-Pakistan relationship. Shortly after the UN ruling, the Peshawar High Court said the attacks were illegal and constituted a war crime. 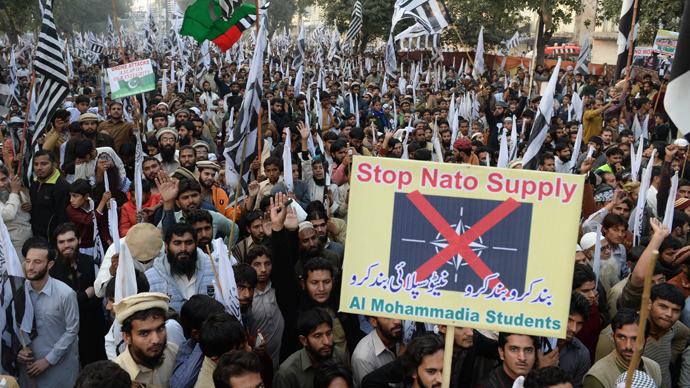 In December 2013, some 5,000 demonstrators took to the streets in Lahore to protest against ongoing US drone strikes. The event was organized by the Defense of Pakistan Council, comprised of some 40 religious and political groups.